Tony Greenstein's Blog: It Gets Worse – Why do leading Zionists ignore anti-Semitism in their own ranks? It Gets Worse – Why do leading Zionists ignore anti-Semitism in their own ranks? 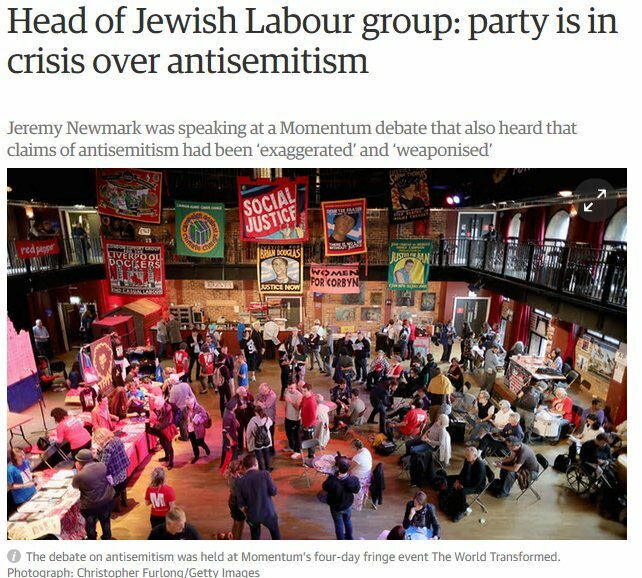 Why does the JLM's Jeremy Newmark have nothing to say about a fellow Board of Deputies member, Jonathan Hoffman, who openly demonstrates with neo-Nazis? Two weeks ago I published an article EXCLUSIVE – Lifting the lid on Collaboration between the Far Right and Zionist Activists. This was followed up by Far-right Britain First fosters ties with Zionist movement by Asa Winstanley. 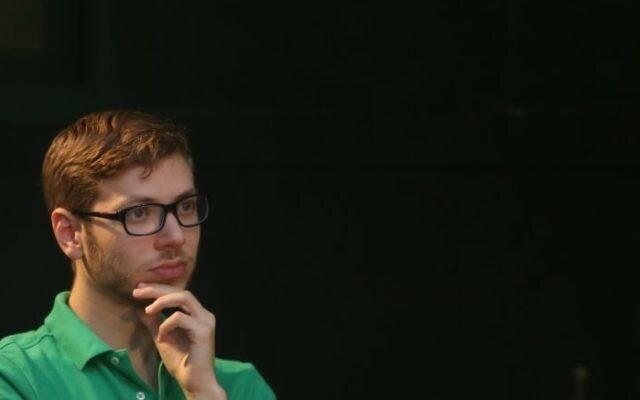 Jonathan Hoffman, a former Vice Chair of the Zionist Federation and a member of the Board of Deputies of British Jews didn’t even deny the allegations. How could he? He was photographed with Paul Besser of Britain First, the group that Jo Cox MP’s killer Thomas Mair was associated with, demonstrating against ‘anti-Semitism’ outside Palestine Expo 2017 on July 7th! 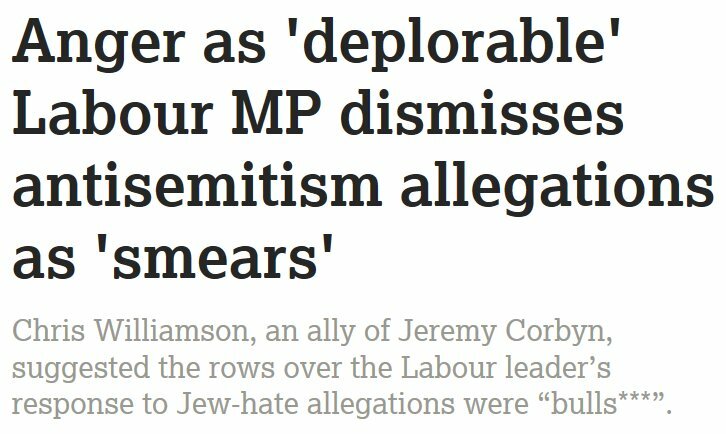 So what was the reaction of those who have been busily promoting the idea that there is anti-Semitism campaign in the Labour Party? Nothing. Jonathan Arkush @JonathanArkush – President of the Board of Deputies s a fierce critic of Jeremy Corbyn for not doing enough about the false ‘anti-Semitism’ in the Labour Party yet one of the members of the Board which he chairs, Jonathan Hoffman @jhoffman1 is openly working with neo-Nazi Paul Besser @paul2Bess. Arkush has also maintained radio silence. And finally Hannah Weisfeld @hannahweisfeld of Yachad, a left-Zionist group. She doesn’t particularly like Hoffman but she believes such things need to be kept within the Zionist family. 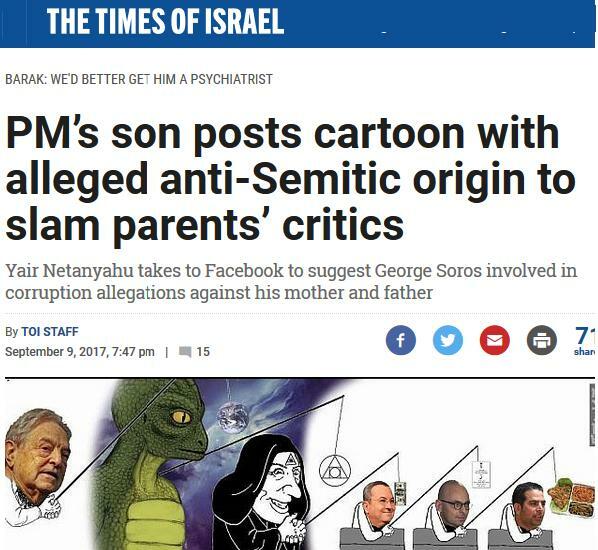 Netanyahu’s own son, Yair, published an anti-Semitic cartoon attacking Soros on Facebook, a bête noir of both anti-Semites and Zionists. Soros is blamed for the problems his parents are having over corruption allegations. 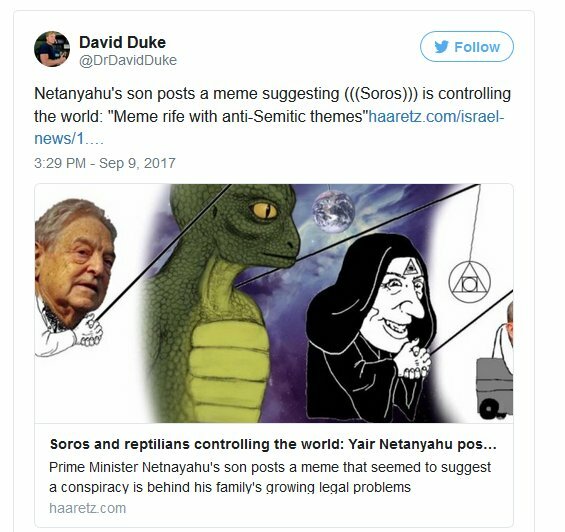 In the cartoon Yair employed the traditional anti-Semitic device of a rich Jew, Soros, controlling an illuminati figure who in turn controls his parents’ accusers. Also included is a lizard figure, another favourite of anti-Semites. Not surprisingly Yair lifted the cartoon from an anti-Semitic site! 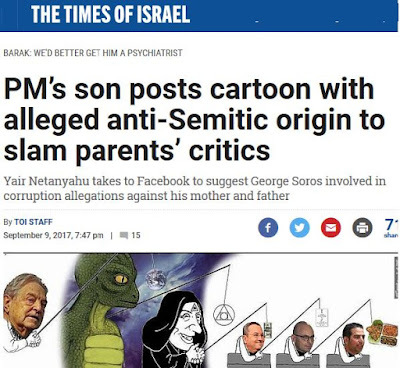 See The Times of Israel's PM’s son posts cartoon with alleged anti-Semitic origin to slam parents’ critics. This is in addition to the invitation to address the Gala Dinner of the Zionist Organisation of America which has been extended to Donald Trump’s former advisor, Steve Bannon, who runs the White Supremacist and anti-Semitic Breitbart News. 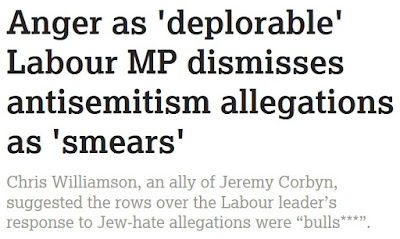 Yet all those above ignore the link-up between prominent Zionists and the anti-Semitic far-Right in favour of an entirely bogus campaign accusing anti-Zionists and Labour Party members like Chris Williamson, Ken Livingstone, Jackie Walker and myself of ‘anti-Semitism’! 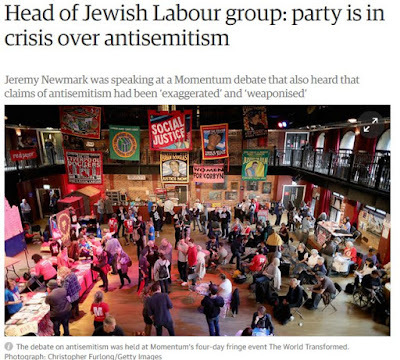 And naturally the Campaign Against Antisemitism @antisemitism, which never hesitates to accuse anti-Zionist of ‘anti-Semitism’ and has posted dozens of articles attacking Jeremy Corbyn, myself and others, has nothing whatever to say about Zionist anti-Semitism.